I'm happy to have the opportunity to fill in for Amanda who has gone to get a massage. Some people have all the luck! 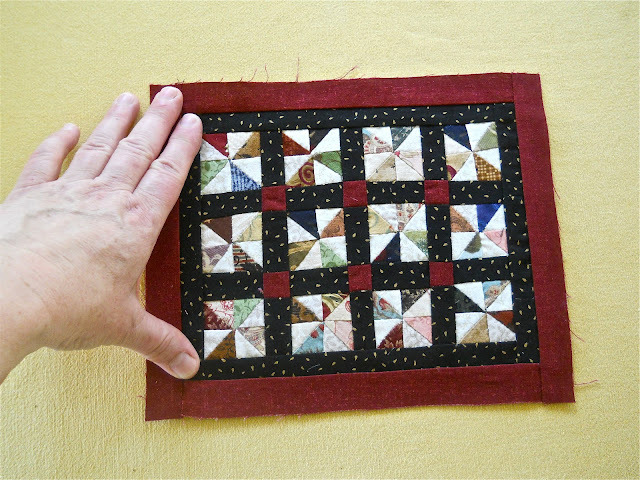 Actually, she has a pinched nerve, so the massage is therapeutic and we wish her a speedy recovery so she can get back to sewing cute little things like this Dresden doll quilt below. It's for her daughter's second birthday so...shhh....don't tell. And in case you're wondering, the center is from Aneela Hooey's "Walk in the Woods". Seriously, cute. Another lucky person in our guild is Elizabeth. She teased us this week with a photo of herself stitching away in Colorado. She is our mini-quilt queen and loves to try out new techniques. And since she was in Colorado when she made this one below, she likes these prairie points going upward just like the mountains. Here's another mini, this time by Agnes. I chose the photo with her hand in it so you could see just how small this little gem is. I think my fingers would get mixed up in the needle trying something so small, but Agnes has serious skillz. Next up is Crys using Sweetwater's Reunion charms and a few pezzy prints. The thing I've noticed with Crys, is that she's not afraid to be random. Being random is like coloring outside the lines and creating something no one else has created. And that, to me, is truly modern. And there's me :) I'm happy to have finished this baby quilt this week. I typically work with brighter colors, but I loved the "sweetness" of these tans and plums. I just have three more to complete by August! Summer has truly hit Oklahoma this week with triple digits. 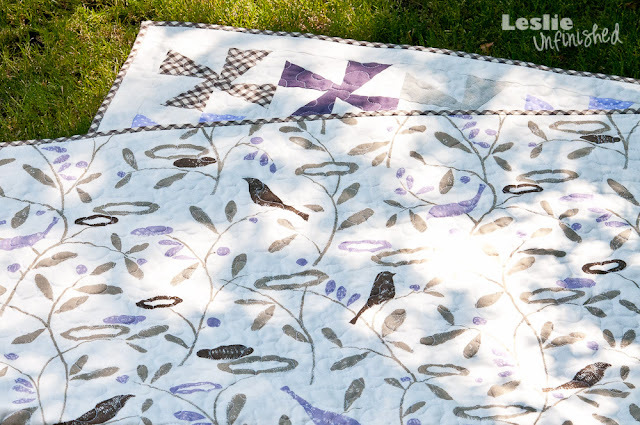 It's so hot (and humid) all you can do is stay inside and quilt all day! Our next WIP Wednesday should have loads of projects! At my age, one CANNOT beat the heat! 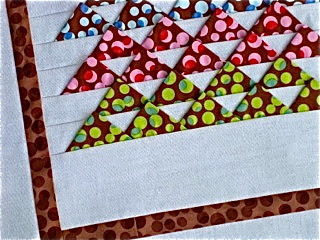 LOL I"m working on a sampler by Atkinson Designs called Graphic Mixx. I'll hang it in our little store window to see if I can attract some New Modern Quilters to come inside for a lesson! 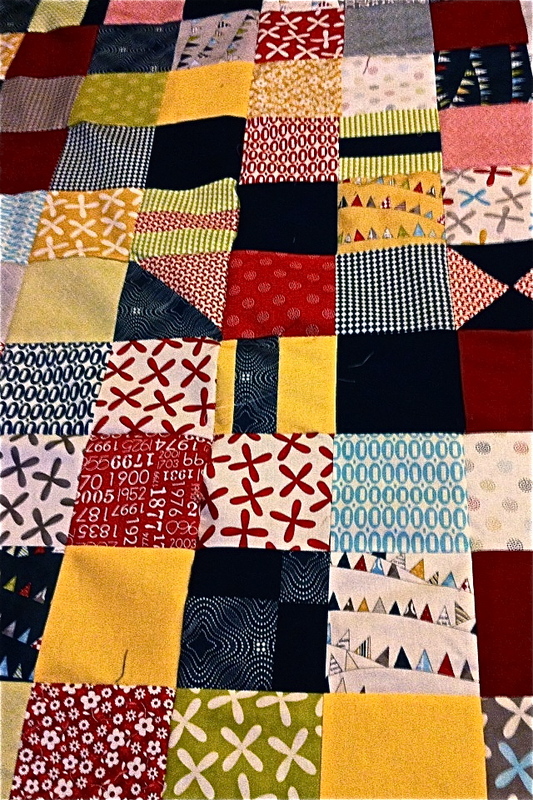 oops, correction, it's called Sarah's Sampler and it's IN the book called Graphic Mixx. sorry. I hate the heat, too! Luckily it doesn't get too warm here in Vancouver. Lots of rain though so it's a tradeoff. I love all the projects here - that mini? OMG! I like your purples/tans - nice to step outside of the box every now and again. Thanks for linking up to WIP Wedneday and have a great week. The center of that dresden plate is adorable!!! I've got some little red riding hood charm squares I have been looking for a project for and a dresden on my 'to-do' list.. maybe I should try using them on it.. thanks for the idea!! 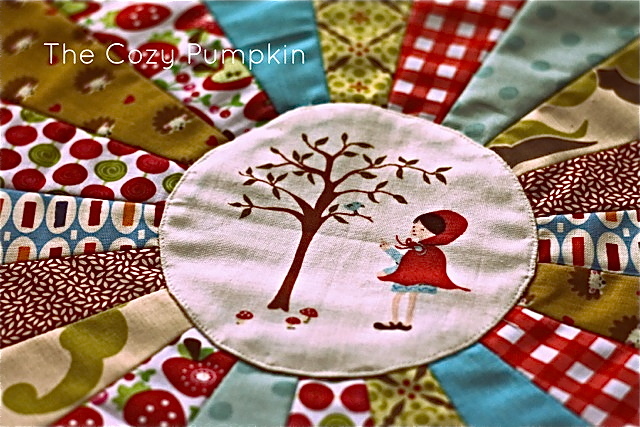 and that baby quilt is just sooooo adorable!!! lovely work...my favorite is Agnus' mini....adorable! !